When the Doc Hubby came home last night and exclaimed, "Have I got one for you!" I got so excited, I started salivating. If I had the energy, I would have started jumping up and down and applauding in anticipation for what was coming. Doc H reminded me of the patient who came in over the weekend with one foot through death's door. This guy was in his sixties and just too young to die. He was incredibly fortunate on Friday night when the on-call surgeon saved his life. Needless to say, the British chap is still recuperating in the hospital. Yesterday, Doc H was asked to round on him and he was happy to oblige. CHAP: (Pointing to his crotch) Doctor, can you remove this catheter? Doc H: (Reviewing the chart) Is it bothering you? CHAP: Do you have some scissors? Can you help me? I need a bit of manscaping. It hurts! What Doc H really wanted to say: Are you effing kidding me? I'm not manscaping you! Doc H: (calmly) I'll see what we can do. What Doc H really wanted to add: Here's a pair of scissors and a hand mirror, pal! Doc H walked out the room and turned to the nurse who witnessed the exchange and was assigned to the Chap. He smiled as nice as he could and asked her to help Chap out. The poor nurse gasped and rolled her eyes at Doc H.
Doc H turned and walked away thinking, "Sh*t rolls down the hill, my dear... it rolls down the hill." I agree! At the very least they should shave, wax and thread at least once each to really empathize with the shackles of our beauty regimes. HA! Thanks for the suggestion, but I think I'll pass. Hahahaha! I hope the nurse didn't roll it down the hill further...to the MED. STUDENT! :( Knowing how a catheter works, my mind is going all over the place. How much hair do you have exactly?!! Ha! I thought about that too. I feel so bad for whoever had to take care of that job. Ick! Thank for the suggestion, but I think I'll pass. Ohhh Emmmm Geee....is about all I can respond with. I am speechless. All I could do was laugh hysterically as he told me the story!! Oh jeez. I know!!! Poor thing! I think Doc H should take some cookies to her station. No wait, the CHAP should!!! Oh my! Now that would be quite the situation haha! That poor nurse bahaha! I feel bad for her too, but in reality, I'm sure that's not the grossest "thing" she's encountered at work. However, I still laugh whenever I think about it! LOL! When my husband was a med student his job was to retract the FUPA. Gross. Wow, that is just something I don't want to touch. That is so funny!!! Yuck, yuck, yuck. 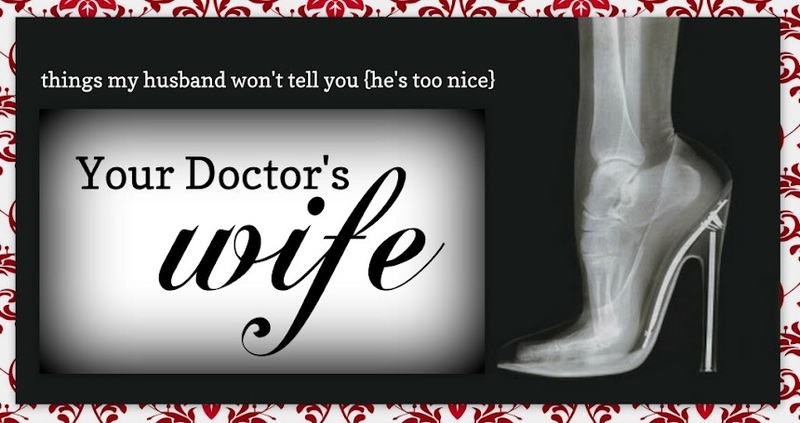 The things that doctor's (and their wives!) experience. Ha! Thanks for the laughs and thanks for linking up with us over at #findingthefunny! Uh-freakin'-mazing! You mean, manscaping wan't what he did his residency in? Oh no! If my husband ever has to have a catheter, I'll make sure to let him know to shave first! I guess I have a different take on this. If the doc is to good to do it why should the nurse be expected to. I think you're kind of slapping down nurses who already have to put up with a lot from doctors who feel their superior to other every day people. I realize they have the degree, and I respect that, but don't belittle the nurse.